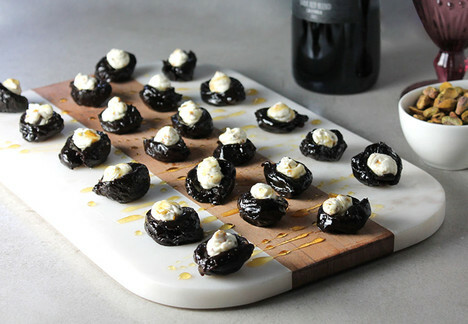 Dried prunes rehydrated in wine, stuffed with cream cheese, pistachios and drizzled with honey. In a medium saucepan, combine prunes and wine. Bring to a boil, reduce heat and simmer for 15 minutes or until wine reduces to a syrup consistency. Remove from heat, allow to cool for 10 minutes. In a medium bowl, combine the cream cheese and lemon zest. Using a hand mixer, mix until smooth. Add the heavy cream and whip. Stir in pistachios. With a sharp paring knife, butterfly cut each prune. Scoop 1/2 teaspoon cream cheese into each prune. Plate and drizzle with honey. Tip: Use your favorite wine to experiment with different flavor combinations.